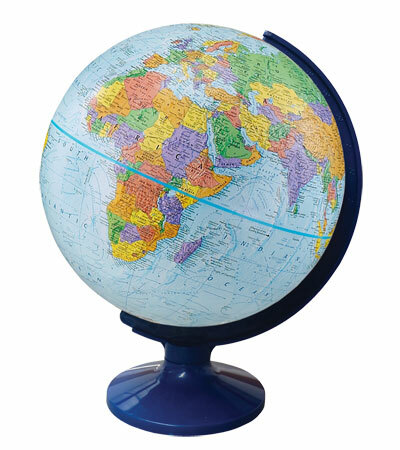 This 30cm globe has a highly detailed map containing over 4000 pieces of information making this globe suitable for advanced geographic study. The cartography features raised relief on the landmass to signify the positions of the world's mountain ranges. Uniquely, the physical globe also uses raised relief to portray the ocean depths, revealing the trenches and mid ocean rises, which are important to the understanding of plate tectonics and oceanography. 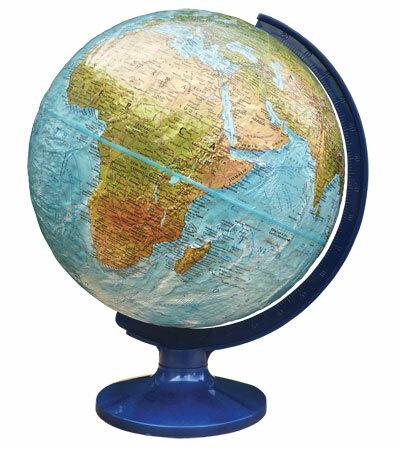 The globe ball is mounted on a durable plastic base and graduated meridian. Assembled in the UK using recycled and recyclable materials and is supplied with an information booklet suitable for use as teacher notes. Suitable for ages 7+, spare parts available.